The King Cruiser Wreck is a large car ferry that sank in 1997 while travelling between Phuket and Koh Phi Phi. There are various theories as to why the vessel sank, including insurance fraud. Firstly, there are no roads on Phi Phi, so why would a car ferry be travelling there, although there were no vehicles on board. 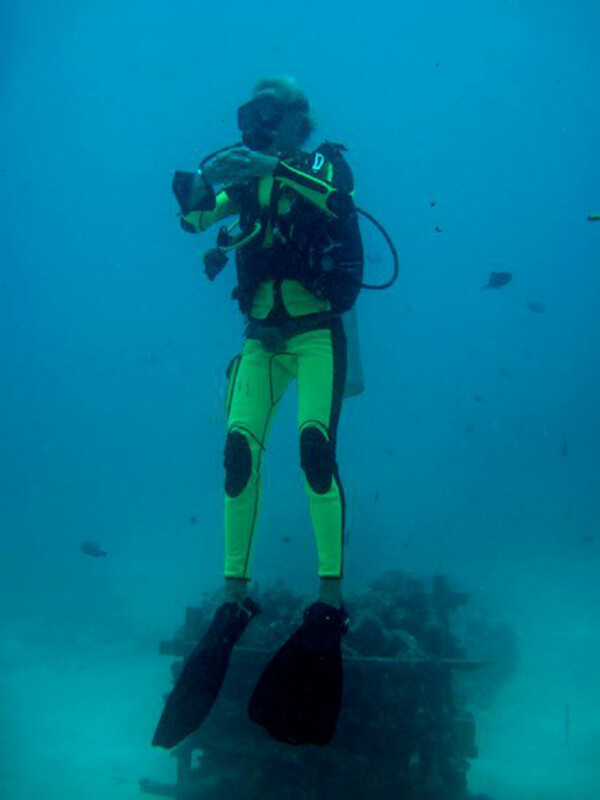 Scuba Diver Photo by Emmy AhlénSecondly, the reef which the ferry ran into and was the cause of the accident was well known by captains and should not have been sailed so close to. Finally, there are rumours that the captain was paid by local dive centres to sink The King Cruiser, or it was done for a fraudulent insurance claim. Whatever the reasons for this vessel's sinking, in which there were no fatalities, it is an exciting wreck dive, and quite a deep one for less experienced recreational scuba divers. The King Cruiser wreck sits in around 30m of water, right next to the reef it hit (Anemone Reef) which is a great dive site in itself. The shallowest part of the wreck used to be a little more than 12m, but over the years it has disintegrated and now the top of the wreck is nearer to a depth of 18m. When the ship first sank, it was easy enough for divers to enter (penetrate) but there wasn't much coral growing on its structure. Nowadays, the corals have come, but not in great numbers, but the years have really taken their toll on the wreck and several areas have collapsed, making it unsafe to enter for most divers and in most sections. This shouldn't take anything away from the wreck, though, as it is a fantastic dive. On days when the water is clear enough the top of the wreck can be seen from the surface, and there is always a lot of life swimming around looking for food or shelter. At 85x12m in size it is large enough to accommodate lots of divers, and during the high season it does get busy. Dive boats from Koh Lanta join those from Phi Phi, Phuket and even Koh Racha (Raya). There are a few things to beware of when diving at King Cruiser Wreck in Thailand. They include the unpredictable sea conditions, which include waves, currents and visibility, and accidentally touching venomous Scorpionfish which rest on the structure. 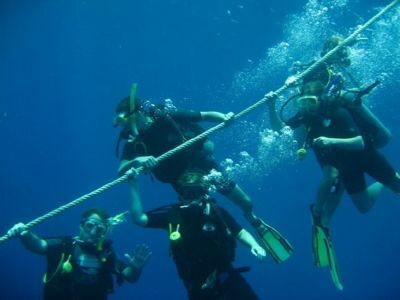 Being exposed to lots of surrounding open sea, there is always the chance of a choppy surface, but this is only an issue when trying to return to the boat at the end of the dive. Currents are relatively predictable, but can be surprisingly stronger (or weaker) than tour leaders or Divemasters expect. While visibility at The King Cruiser wreck can be awesome, well in excess of 20m, it can also be less than 10m. This makes it a disappointing dive, especially when there's a current as well. Luckily for those visiting from Koh Lanta dive centres, there's Anemone Reef right next door, which can be enjoyed in lower visibility conditions. Divers on mooring line Photo by Emmy AhlénThe marine life one can expect to see at King Cruiser wreck includes huge schools of barracuda (Syphraena) along with quite a few other species of pelagic and predatory fishes. There are a few sharks to look out for here, including the slim chance of a Whale Shark (Rhincodon typus) at certain times of year. Leopard/Zebra Sharks (Stegostoma fasciatum) are common in this part of the world, and although nice to look at, divers from Koh Lanta visiting the King Cruiser will almost certainly have already seen these harmless nocturnal sharks. Similar, but much shyer, are Bamboo Sharks (Hemiscylliidae), which are usually hiding in the daytime. Mid-size to large fish here include several species Snappers (Lutjanus) and Trevally (Carangidae) which swim around the wreck, and Lionfish (Pterois) swimming boldly near the wreck and Scorpionfish (Scorpaenidae) hiding in camouflage. Sea turtles, such as Green Turtles (Chelonia mydas) and Hawksbill Turtles (Eretmochelys imbricata) make the occasional visit, but shouldn't be relied on. Generally, The King Cruiser wreck is a great dive site for Advanced Open Water divers and those more experienced Open Water divers. However, it's not unheard of for those taking part in the 3rd and 4th dives of an Open Water course doing so here. There are always plenty of fish and invertebrates, and when conditions are good, plenty of other divers, too. When currents are stronger than normal dives here can be short, as the wreck is too deep for less-experienced divers wanting to conserve their air, and the mooring lines can become a little crowded with those both ascending and descending. For anyone diving from Koh Lanta, especially over a period of several days, it's a highly-recommended dive.